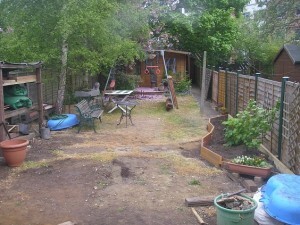 On the right, we have created a raised border already, in which herbs, veg and flowers are growing. No railway here. On the left, you can see two Silver Birch trees. These were planted about 12 years ago and create an area of shade. Along that fence is the remains of the old railway that used to run up the garden and round the back where the log cabin is now. A raised border will be built between the trees, coming out into the garden in front of the log cabin, and the railway will run along the front and back of that border in an out-and-back fashion. The shade and roots from the birch trees create an interesting challenge for an amateur horticulturalist. The grass is indeed dying. We decided to kill it all off and start again, partly because we need to lower the left side by a few inches and partly cos it’s terribly bumpy everywhere. We know it’s a mad thing to do, but we are being realistic, and expecting to have no grass for a few seasons.